Wow, thanks to everyone for the fantastic comments on my last post! Considering that I’ve only just recently started posting, and sporadically at that, I didn’t really expect anyone other than my close personal friends to ever actually read it let alone comment. But then all the bloggerati showed up and said amazing things! And then the lovely Scruffy Badger went and mentioned it on her blog! Oh my goodness! It’s all a bit much to believe really. I came over positively faint. Really. So thank you everyone for your comments and kindness and for giving me the taste of the warm glow that comes from interacting with the blogging community. What awesome people. I hope you don’t mind if I carry on with the theme. I thought of including these in the last post but decided that this story, and Sarah in particular, deserved its own separate bit of space. As I’ve said before, I decided in my teens that I HATED being photographed and would happily spend the rest of my life avoiding cameras. And I succeeded in this for the next decade. Then something strange happened. Firstly, I decided that I wanted to have a few more photographic records of things as I realised that a decade with virtually no visual history was actually kind of sad. Secondly, I decided to confront a bunch of my fears and uncertainties head on and decided to include photos in that. Both of these meant making friends with cameras. A professional photo shoot in 2010 broke my habit of running in terror when I see a camera lens pointed at me, meaning I started showing up in candid shots from social gatherings. But I still feel pretty awkward being photographed. I got lucky and met Sarah shortly after my professional shoot. Sarah is amazing. 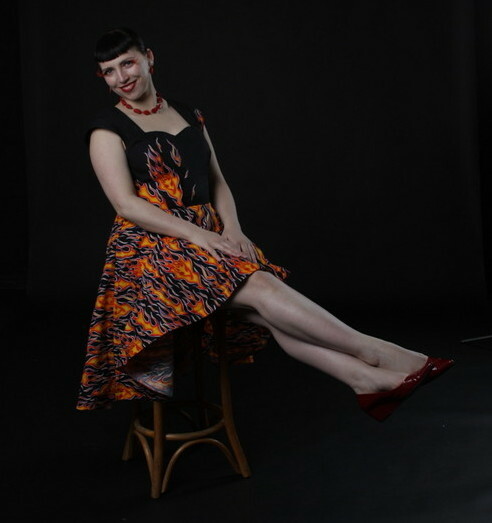 As well as being kind, smart, and witty, she sews without fear, creates beautiful things, and is a very passionate and talented photographer to boot. And she’s actually a real astrophysicist or something like that. Sarah is the delightful friend who pinned flame appliques to my bodice, and then late at night tacked flames onto my flatmate’s shirt just because. She blogs her photos too. Sarah quickly became the photography lynch pin in my amazing circle of friends (about to get their very own post) and between her camera and the amazing costumes my friends create there has been more than one photographed dress-up day. I’ve found these awkward but have done my best to learn to get comfortable around the camera and Sarah has been great, letting me screen photos before she posted them. Sarah is keen to improve her portraiture, and I’m keen to progress from no longer being uncomfortable to actually being photogenic, so we decided between us to get together and practice. Photos from some of these shoots will show up soon! Recently Sarah decided to hire a photography studio for an afternoon and get a lesson in using fancy-pants studio lighting. And she asked me to be her practice model for the day. 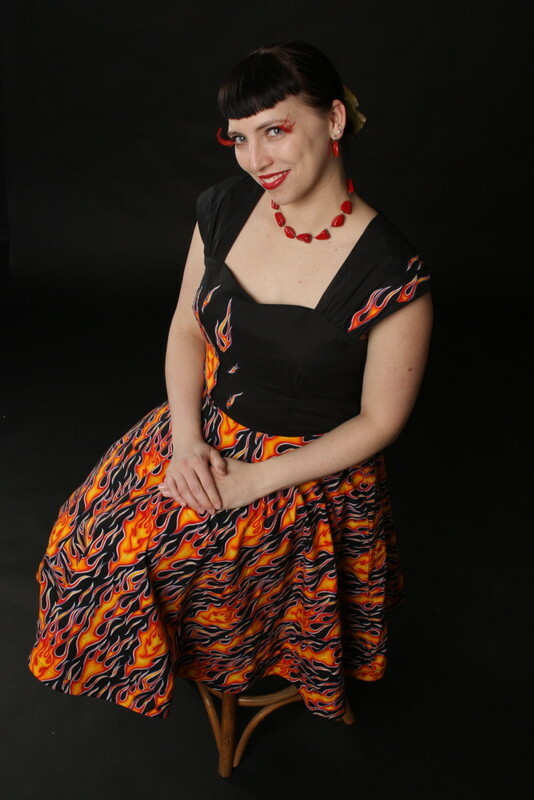 And she asked me to wear the flame dress. And she produced some amazing photos. Is it just me or does this look like an old-fashioned school photo? As well as these, Sarah took some arty photos of me in various costumes out of our mutual curiosity to play and experiment. This is one of my favourites. She also kindly took some family shots of me with my mum and her partner, who were staying with me at the time. I don’t think there are many photos of me and my mum together, which is a shame as we are so close. I won’t share them as I don’t think Mum would approve! Really, I can’t say thanks enough to Sarah for her time, her generosity, and her friendship. And these photos. Now I’m awfully worried that I’ve set the bar too high and showing you all ordinary clothes in ordinary photos will be somewhat of a let down. I’ll do my best though! My skull and roses dress makes me happy. 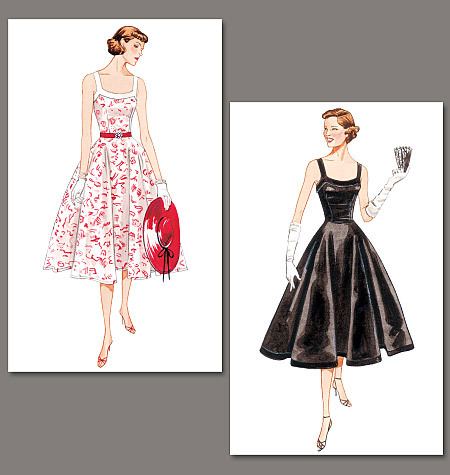 It brings together three of my favourite loves – 1950s style dresses, rock and roll dancing, and a little bit of subversion! And it is associated with so many happy memories! 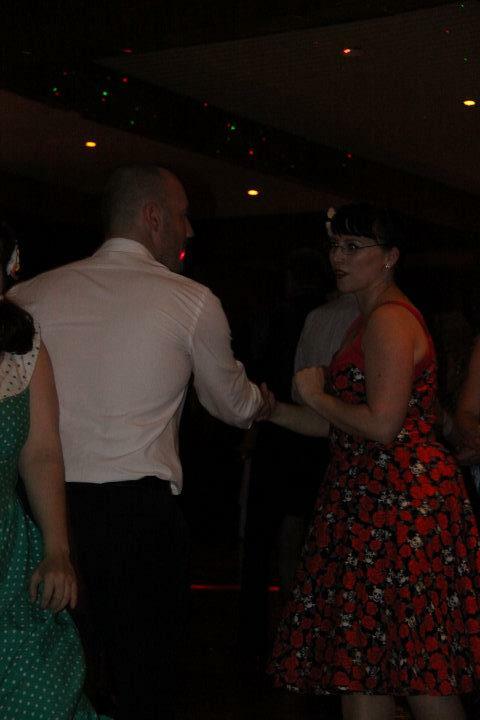 I started learning rock and roll dancing in June 2011 with Feet with Heat, and in September was the annual ball and show. Ooh how I wanted a fancy dress to wear! I wanted to turn up to that party looking as hot as I possibly could. 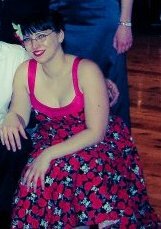 Fuzzy, grainy, low-light picture of me and the dress in action at the ball. The polka dots on the edge are Miss La Belle also getting some dance floor time. Finally the fabric arrived from its long and arduous trip across the globe. On the Monday before the Saturday night ball. EEEEK! There was no way to get it made. For a start, I’m not a very competent sewer (yet) so tend to take my time. Secondly, I had several nights of classes that week to make sure I was as dance-fit as possible for my first night out social dancing. 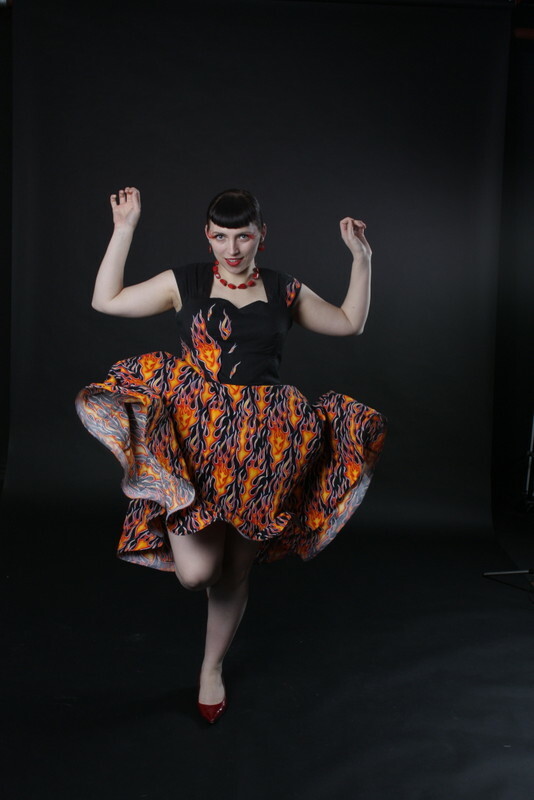 I didn’t want to give up the dance classes to make a dress to wear to the event that the dance classes were for! So I settled on my back-up plan, a regular dress out of my wardrobe. I made it to the hair appointment just on time, got back home with just enough time to meet up with the lovely Miss La Belle and slap on my makeup and false eyelashes, pull on my petticoat (another MrsC wonder), and arrive at the ball fashionably late – just in time for dinner to be served. 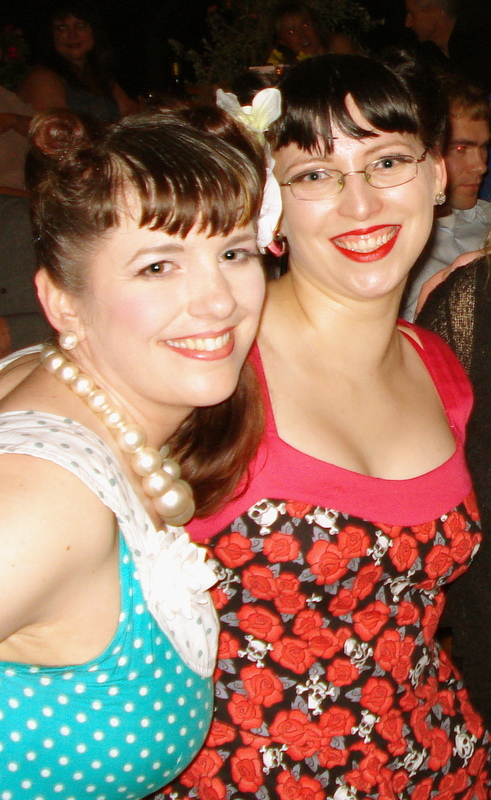 Cropped from another terrible photo of the dozen of us still going at 1am when the venue tossed us out. It’s a terrible photo but look! I have a cleavage! The dress performed amazingly well that night, fitting me perfectly and comfortably and most importantly swirling wonderfully! I love that it gave me a subtle improvement in my normally lacklustre cleavage! And I especially love that several people had to do a double take when they realised that there were cute wee skulls and crossbones peeking out from behind the roses. Hehe. Unfortunately I have very few photos from the ball, and as you can tell, none of them are very good! But there are plenty of it in action at my first rock and roll competition. 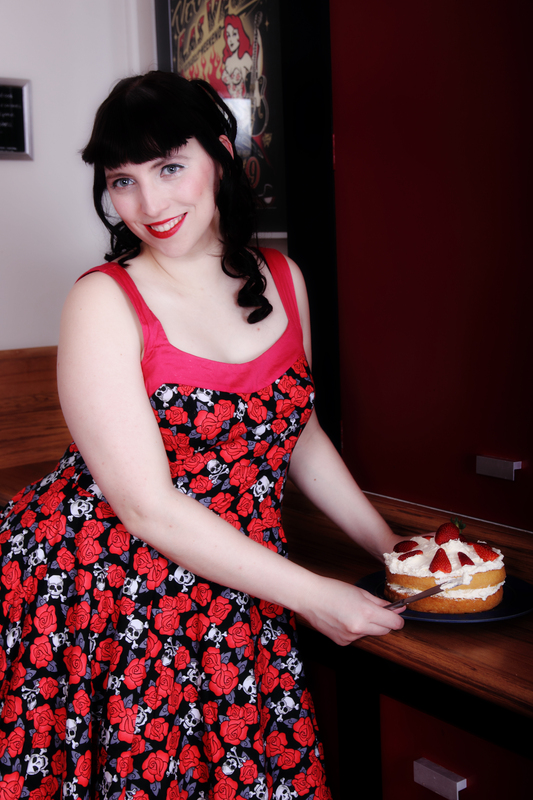 But I was lucky enough to be invited by another dear friend, Sadie von Scrumptious of Ever So Scrumptious to participate in a retro-kitchen-cheesecake-pin-up photo session early this year, along with the amazing Miss La Belle and the fabulous Winnie Chester, with pictures taken by the extraordinary Toya of Digitalpix. As explained, I have a history of avoiding cameras, so I decided last year to take that on by getting as many pictures taken of me as I can, and learning to like them. 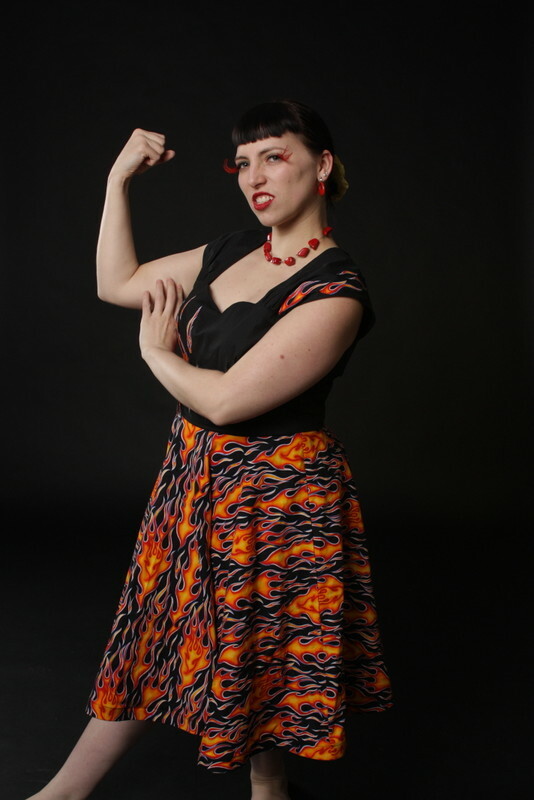 I’m succeeding in getting more photos of me taken, but only slowly progressing towards liking them. A natural model I am not! But it was wonderful fun and I am so grateful to this fabulous collection of women to have them in my life and to get to participate in this day and have these pictures to commemorate. Fabric: Alesander Henry craft cotton from eQuilter – bought especially for this project and used straight away, shock horror! Time to complete: for me, not much. Thanks MrsC! Even so, there’d be a few hours in the mock-ups and the hem. So much hem. What I learned: I have awesome friends. I still don’t know how my back and shoulders affect fit. The internet is great when it comes to things like putting an invisible zip into a side seam. How to put an invisible zip into a side seam. Wearable? It was my go to dress for rock and roll events, until this year’s ball and this year’s dress. I haven’t figured out how to wear it socially/casually without feeling a bit weird. I intend to fix this. Likeability: Love it. Love it. Unsolicited comments: frequently. And I won best dressed at a dancing competition in it too!